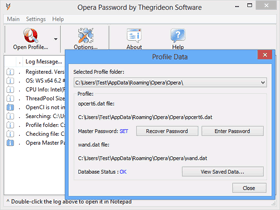 Opera Password by Thegrideon Software is feature-rich password recovery tool for Opera Web Browser. Opera Password allows you to recover Master Password and view saved logins and passwords (decrypt wand.dat database). Logins and Passwords are recovered instantly if Master Password is not set (or is known). Opera profile can be located automatically or selected manually. Highly optimized code guarantees maximum performance. Supports up to 64 simultaneous processing threads (multi-CPU, multi-core and HT). New Opera 12 is supported. wand.dat - database with saved web addresses, user names and passwords. opcert6.dat - database with encryption keys. Opera Master Password protects additional data stored in opcert6.dat and required to decrypt wand.dat content. Both files are part of Opera User Profile folder. If master password is not set or is known: logins and passwords data can be instantly decrypted. If master password is set and unknown (lost) it has to be recovered first. Encryption methods used for master password protection are quite strong and its recoverability depends on length and complexity, however recovery speed is relatively high. In order to recover this type of passwords, candidates have to be created based on dictionary, mask or sequentially based on a charset and length selected. Opera Password allows you to try all these methods with a number of additional modifications including unique keyboard layouts-aware recovery technique. We did our best to enhance this tool performance as well as the recovery speed with some advanced methods and it found to be the fastest tool for Opera password recovery. Trial version allows you to search for Master password of up to 4 characters in length.